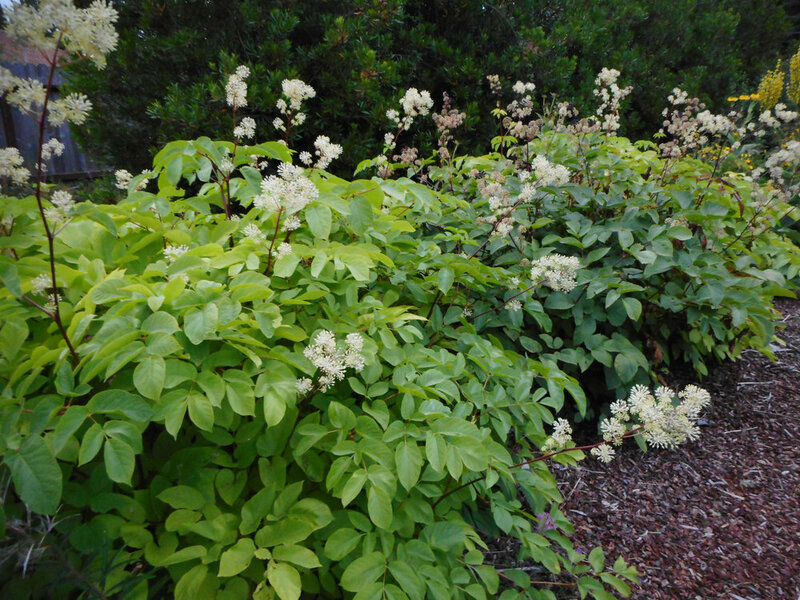 A beloved, distinctive plant found throughout much of coastal California and into the state’s northeastern mountains as well as far southwestern Oregon, Aralia californica is a large herbaceous perennial. It grows up to 3 meters high and wide in the shadows of redwoods, Douglas firs, pines, maples, and alders at elevations less than 2500 meters (Preston & McClintock, 2012). It especially favors wet and shady locales along creeks, ravines, river banks,and springs (Nguyen, 2017). Each year entirely new growth emerges from its large, highly resinous rhizomes, which resemble a flow form and sometimes form a large ‘V’ when matured. They are often found deeply entrenched amongst streamside rocks or woody debris, and their thick tap roots extend straight down for many feet into ground water in order to stay moist during the region’s extremely dry summers and to stay put against raging flood waters that tear down the creeks of coastal California during our (usually) heavily rainy winters. The largest California spikenards are often found snaked around thick tree roots, which provide further anchor, while others may be ensconced safely in the duff deposited at the bend of a creek. In many cases they form thick stands lining favorable stretches of waterways. Each leaf can be up to 2 meters long and up to thrice-pinnately compound (Preston & McClintock, 2012). Smooth to the touch, the long petiole bears ovate to oblong, glossy green leaflets (about 15-30 cm long each) with serrate margins, cordate bases, and acuminate tips(Preston & McClintock, 2012). The flowers are found in graceful, starburst inflorescences; a panicle of umbels that arc towards the light in early summer and then lean towards the ground as the tiny purple-black berries, eaten and disseminated by birds, mature and gain weight into late summer and fall. The berries have potent medicinal value, but watch out! Eat them raw, and you may notice your throat becomes irritated due to their acrid nature. The genus contains about 30 species in North America, Asia, and Malaysia (Preston & McClintock, 2012). Two other North American species stand out for their medicinal action.Aralia racemosa is the closest known relative of A. californica and is also valued for its effects on the lungs (Wen et al., 1998). It has two subspecies, one found in the Appalachian mountain sand the other in the American Southwest (Wen et al., 1998). A. nudicalis, known for its alternative and adaptogenic effects, also occurs in the Appalachian mountains. In the US there are at least two other well-known native, medicinal members of this family, called Araliaceae (also known as the ginseng family): devil’s club (Oplopanax horridus) of the Pacific Northwest, and American ginseng (Panax quinquefolius) of Appalachia. Araliaceae is closely related to Apiaceae, the carrot family, and members of the two families can share some resemblances, which means we must apply the same scrutiny to identification of California spikenard as we might for members of Apiaceae, as that family contains California’s most poisonous plants, poison hemlock and water hemlock. California spikenard is often harvested in mid-winter after most of the identifying features of the foliage and flowers have withered away, and Apiaceae plants such as poison hemlock, water hemlock, and cow parsnip (a low-dose medicinal with many contraindications) can share a general resemblance in this state. The flower stalks and roots of those plants have different structures than California spikenard has – this said, be very vigilant and never harvest anything you’re not 110% sure about. California spikenard exudes a sense of wild strength and motherly love, and is a joy to grow in the garden. It can be propagated from seed, crown division, or rhizome cuttings. Like many wild plants, California spikenard seeds may not easily yield to our expectations for how a seed is supposed to germinate. Rather than subjecting them to traditional garden conditions, we need instead to mimic wild conditions using a little bit of backwoods ingenuity. To learn more about how to do this, I turned to local seed whisperer Tina Glaessner, who is the proprietor of the stunningly diverse medicinal plant nursery Crimson Sage Nursery, located deep in the wild Klamath River basin in the heart of California spikenard country. She shared the following tips: California spikenard berries are commonly consumed by birds, and when the seeds are exposed to their digestive process, it may strip away some naturally occurring germination inhibitors. To mimic this at home, Tina recommends collecting half rotted, ripe fruits in late summer, placing them in a plastic bag in the fridge where they can continue to break down and ferment slowly (breaking down the inhibitors) for a few days or until you’re ready to sow them. Then, spread the whole mush over a wooden flat filled with soil. Sprinkle a very thin covering of soil over the mush, place the flat in an unheated greenhouse or cold frame over winter to prevent the rain from washing the seeds away, and keep the flat moist until early spring when the temperatures naturally warm up again. This will expose the seeds to a cycle of warm, cold, and warm seasonal temperatures, stimulating their natural germination processes(Glaessner, 2019). Exposing seeds to cold temperatures is a process called “cold stratification” in horticulture, and the need to be exposed to these conditions serves as a sort of biological clock for the seed so it can germinate at the perfect time of year for the best chance of survival, and only during that time. If you have pre-cleaned seed and are trying to germinate it during a different time of year, you can try placing it in a bag of moist sand in the refrigerator for a few months, then attempt to germinate. Seeds will take approximately 2 months to sprout – so don’t give up on them! Just keep them moist and shaded until they begin to emerge (Nguyen, 2017). A simple way to propagate the plant is to make a rhizome cutting, making sure to select a section bearing a healthy bud. In late winter, divide the plant and take an approximately 8 cm long cutting of the rhizome (Nguyen, 2017). This can be stored in sand until spring to prevent rot, or replant it immediately and keep it moist but not sopping wet (Nguyen, 2017). Pot up once your new plant is growing a new shoot and seems sturdy. When deciding where to place your California spikenard start, keep in mind this tender yet hardy plant is happiest when given shade against the heat of the day, protection from wind, and well-drained soil with access to a natural water source throughout the summer. If given these conditions, after it has established it may be able to survive our arid western summers without added irrigation. When planting, place the plants deep enough so the top of the rhizomes are just covered by the soil or rocks. When wild planting along creeks, offer the plant some stability against raging creek waters by nestling it amongst large rocks or roots. You want it close enough to the creek that it has some access to water during the hot season, but not so close it will be washed away during winter. A slow growing plant, it may take a number of years for a root cutting or seedling to reach a harvestable size. If you’d like to purchase plants for your garden, you can mail-order plants from Tina at Crimson Sage Nursery. For restoration efforts within its natural range, you can also purchase plants from your closest native plant nursery, such as California Native Plant Society’s Native Here Nursery in the Berkeley hills, which is committed to preserving diversity in native plant gene pools. You can also try other sources listed here on the California Native Plant Link Exchange. Seeds can be found at Strictly Medicinal Seeds. Please review the safety notes above under RELATIVES AND LOOK-ALIKES. California spikenard is listed on the United Plant Savers “To Watch” list (“Species At-Risk List”). It is not a plant that can be commodified for capitalist interest without causing injury to the species. It is also an important plant for native peoples of California, and it is critical that non-native people not impact traditional gathering areas. California spikenard is a locally abundant herb with a limited range, meaning that where it grows, it can grow abundantly, but the range is limited to a small area of the world, which like most wild places, is increasingly under pressure. It is a slow growing plant that takes time to reach maturity, about 3-5 years, and thus it doesn’t reproduce itself very quickly. I do not know the answer to the question of whether the population can handle even limited, non-commercial, wild harvest amongst people who live in its range. I will leave this to my elders to determine. Some alternatives to California spikenard you may consider include elecampane or garden angelica root for California spikenard’s respiratory actions, or organically cultivated ginseng for its adaptogenic effects. I believe in harm reduction, so I offer the following notes: If you do choose to wildcraft, cultivate a personal relationship with the land before you harvest. This should be considered a significant undertaking, and requires much more than a single site visit. There is much literature to be found on the subject of tending the wild (including an excellent video series featuring the voices of indigenous Californians, found here). Despite the colonial mindset that wild areas are "untouched by man", the land in California has in fact been cared for and actively tended by indigenous people since time immemorial. 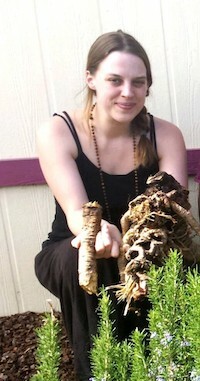 In an article calling for a 7-year moratorium on wildcrafting, Karyn Sanders (a Choctaw herbalist who practices and teaches in Northern California) wrote “before you think to take plants from the wild, you should plant and tend some.” She suggested that one tend to a wild place for least four seasons to “set yourself to that area forever,” thus cultivate a personal responsibility for the land and all the beings that live there (Sanders, 2005). If you want to learn more about best practices for replanting wild plants in your area, listen with gratitude and respect to what is being shared by indigenous peoples in your community, and contact your local native plant society; they may recommend specific plant sources to protect local genetic diversity. As for specific practices to reduce harm when harvesting California spikenard, you may choose to harvest only leaves. If harvesting rhizomes, do so only if you see at least 25 or so plants around (Sinadinos, 2008). Take caution when contacting the resin, as some are allergic to it(Sinadinos, 2008). You are strongly encouraged to replant a portion of the rhizome that bears some healthy buds, as described above under CULTIVATION. The rhizomes grow in a “V” shape; consider only harvesting a portion of the bottom of the “V” or just one side of the “V”, and leave a portion of the growing end of the rhizome in the ground to live on (Kloos, 2017). If you’re harvesting in summer, consider cutting back the aerial parts on the remaining portion of the plant to reduce water stress (Kloos, 2017). When harvesting berries for medicine or to start your own plants, it is critical to limit removal to just a small portion, so the birds can continue to eat them and spread the seeds over the landscape (Kloos, 2017). I have not come across very much historical literature that specifically elaborates on California spikenard. If mentioned at all, it is often noted as simply being used the same as Aralia racemosa. Nor have I found a single scientific study that describes the use of Aralia californica. I have not reviewed sources written by anthropologists about the use of this plant by indigenous peoples of California, as I wish only to source those with personal experience with the plant, and to allow indigenous people to speak for themselves. I do reference one excellent book written by the late Karuk/Shasta/Abenaki herbalist Josephine Peters. All parts of the plant can be employed for medicine, including the leaves, rhizomes, roots, and fruit. Leaves can be lightly harvested in early to mid-summer when they are at their peak of vitality. Most commonly prepared as a tea, California spikenard leaves offer a mild adaptogenic effect for those experiencing depletion or anxiety due to chronic stress (Kloos, 2017). Their gentle lung tonifying properties soothe the airways. The rhizomes exude a milky oleoresin that is especially abundant when harvested in winter. Michael Moore states that “spring roots make a better cough syrup and expectorant, and fall roots seem to have better tonic effects” (Moore 2001, p 119). A member of the ginseng family, it may have some constituents in common with its better known cousins in the Panax genus. California spikenard root is especially known as an excellent lung tonic, helpful for both acute and chronic lung conditions. This is a plant I’ve seen work miracles - in elders with mild emphysema/COPD in it has reduced lung spasms and improved respiration, while in current smokers and in those with sensitive lungs who fall prey to bronchitis each winter it has been just the trick to break the cycle of illness. California spikenard is an aromatic expectorant; the resins gently stimulate the lungs, increasing circulation and nutrient flow to the tissue and improving removal of waste products. It can restore secretions in dry coughs and also thin and liquefy the thick stagnant mucus characteristic of moist lung problems (Sinadinos, 2008; Moore, 2001). It has antimicrobial, antitussive, and demulcent effects especially supportive for those with acute lower respiratory infections. Interestingly, Josephine Peters, , a native Karuk/Shasta/Abenaki herbalist from the Klamath River region of Northern California, describes its benefits for sinus troubles and sore throat, but did not indicate use for lung conditions (Peters & Ortiz, 2010). The restorative, anti-inflammatory, and bronchodilation effects make it a key remedy for those with asthma or COPD(Kloos, 2017; Sinadinos, 2008; Moore, 2001). It is a potent preventative tonic for those prone to respiratory infections when consumed for a few months before the cold and wet season (Sinadinos, 2008). It is also a great help for the clean-up phase after infection (Sinadinos, 2008). Some of these long term benefits are related to its alternative and adaptogenic qualities (Kloos, 2017; Moore, 2001). California spikenard can bring great benefit to those who are exhausted and frayed at the edges, especially if their lungs are the weakest link under chronic stress. Josephine Peters wrote in her excellent book After the First Full Moon in April that a poultice of California spikenard root applied on the back of her head and neck and down along her spine was critical for helping her recover quickly from a stroke when she was in her 30s. She also used the poultice topically to draw blood from bruises and black eyes, and to relieve swelling from sore or arthritic joints (Peters & Ortiz, 2010). California spikenard root is also known to gently stimulate uterine contractions that help to bring on childbirth. It can encouraged menses delayed by stress or exhaustion, and can also benefit excessive menstruation (Sinadinos 2008; Peters & Ortiz, 2010). Consume the hot tea or tincture in hot water to stimulate the uterus (Sinadinos 2008). The berries are harvested in late summer and early fall when purple-black and ripe. Prized for their support for those experiencing seasonal depression, their uplifting effect can also benefit those prone to hormonal mood swings or postpartum depression. (Kloos, 2017; Sinadinos 2008). They are often utilized as a non-stimulating adaptogen helpful for depletion and fatigue in younger folks (Sinadinos, 2008). Some sources mention it as a soothing remedy for sore throat, though I found it to be incredibly acrid (Kloos, 2017). Not appropriate for use during pregnancy except to bring on labor. Test herb for allergies topically before use internally. Use caution when harvesting and processing if allergic(Sinadinos, 2008). Tincture: Fresh root (1:2, 70-95% alcohol); Dry root (1:5, 60% alcohol): Consume 10-90 drops, up to four times daily (Moore, 2001; Sinadinos, 2008). Fresh berry (1:2, 70-95% alcohol): Consume up to a teaspoon (Moore 2001). Glycerite: Fresh root or berry (1:2, 50% glycerin, 50% alcohol). Consume (Sinadinos 2008). Root honey: Cook fresh roots in honey (1:4, root to honey). Consume 1-2 teaspoons up to 4 times daily (Moore, 2001). Tincture syrup: Mix tincture in equal parts with warmed, liquefied honey, stir vigorously to dissolve. Consume 1-2 teaspoons up to 4 times daily. Tea: Prepare a standard hot infusion of the berry or leaf, a cold infusion of berry, leaf, or root, or a strong decoction of the root. Consume 8 oz up to 4 times daily (Sinadinos, 2008). Hailing from the wild redwood forests of northern California, Selena Rowan has made her home in Portland for the past two years. A western and Ayurvedic trained clinical herbalist balancing a background in biology with a commitment to radical embodiment and reconnection to nature, Selena works to help restore reservoirs of resilience in those she supports. She strives to maintain an anti-oppression and trauma informed perspective, and she heartily welcomes people of color and LGBTQIA+ folks. Selena speaks some Spanish and warmly invites people who do not speak English as a first language. She is available to support you with range of health conditions. Selena is grateful for the teachers who have supported her on this path: Christa Sinadinos, Greta de la Montagne, Traci Webb, K.P. Khalsa, Janet Czarnecki, Erico Schleicher, Sabel Regalia, and others. Selena dreams of a world where ideals of mutual aid, earth renewal, and love guide us in all we do. • Glaessner, T. (2019). Personal correspondence. Crimson Sage Nursery. Orleans, CA. • Kloos, S. (2017). Pacific Northwest medicinal plants: Identify, harvest, and use 120 wild herbs for health and wellness. Portland, OR: Timber Press. • Peters, J. & Ortiz B.A. (2010). After the First Full Moon in April. Walnut Creek, CA: Left Coast Press. • Sinadinos, C. (2008). Professional Herbalist Training Program [Lecture]. The Northwest School for Botanical Studies, Arcata, California.